Wiring is similar to filling in a dot to dot picture or following a road map. Join some track. Hook track to transformer. Run a train. As you add more track, wire, and turnouts, stop and Test your work by running a train. Protect you, your house, trains, wire, and accessories. Transformer internal breakers protect transformers, NOT trains. Shorts or faults can damage your toys and burn down your house. Circuit Protection on the low voltage side of transformers is the same as having breakers in the circuit box for your house wiring. 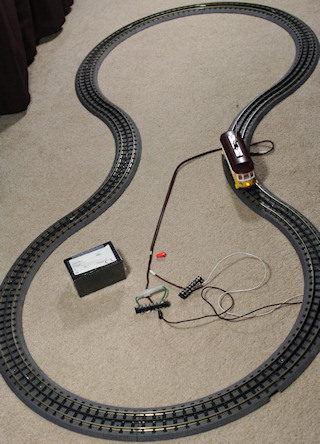 There are many techniques for wiring a layout. These have worked for me so that I can play trains instead of messing with the wiring. The date tags on items in photos are part of my inventory system. Here is a dot to dot diagram for a basic loop of track. Tug test all connections as you wire. (Set instructions are very helpful.) 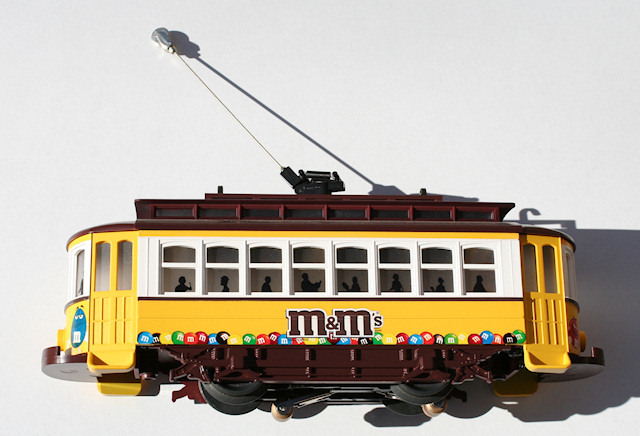 The mark on the transformer knob aligns for correct speed for the trolley. Note two wires on each terminal. The red and black wires from banana plugs have spade connectors under the transformer screw plates. The red and white wires of to the right side would be used for a second track connection on the far side of track. This "Carpet Central" Layout will work with motorized vehicles. 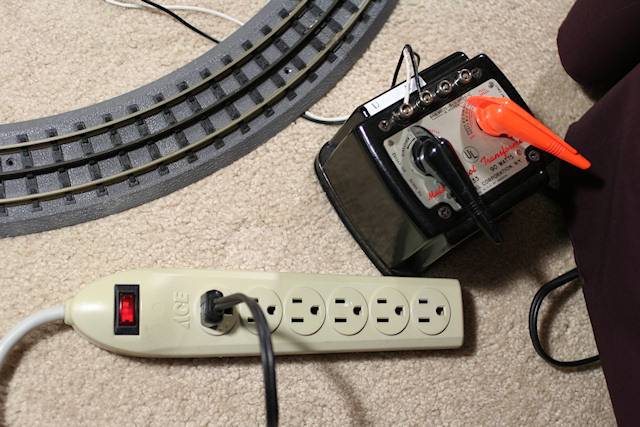 Plug transformers into a lighted power strip. The Lionel postwar 1033 varies track voltage (black lever) and blows the whistle/horn (orange lever). Combining two set loops of MTH 0-31RealTrax resulted in this "dogbone". Motorized vehicles run good on it. Train derailments are more likely with back to back curves shown here. Six short straights between the inside curved tracks would be a big improvement. The components above can be installed in a project box for frequent use. Auto reset breakers are preferable to fuses. The split terminal strip makes it easier to add track taps if your train slows on the far side away from the first tap. My wire color coding uses white for the track outside rails and black for the center rail. 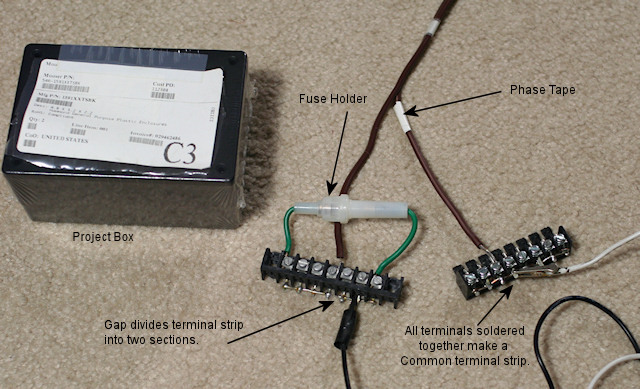 Extra variable voltage (center rail) taps would be tied in to left side of left terminal strip. The extra common (outside rail) taps would be tied to any terminals on the right terminal strip (all common). The fuse holder can be replaced with a resettable breaker or a PTC resettable fuse. 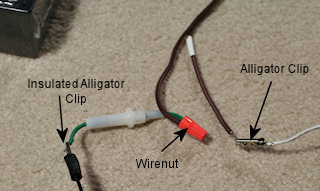 Alligator clips are crimped and soldered to stranded wire for temporary connections to modern track. Rubber Tape was added to the bumpers so two trolleys running together will bump and reverse each other. The wheel balancing stick-on weights on the bottom at each end stabilize the trolley. track together when it is not screwed down. Set track example with track clips and two track connections. On single loops of track, if trains slows on far side of first connection, add another connection. If track is screwed to surface, connect to every third section of track so that all track is touching one wired section. The above set comes with one lockon. Added track will require additional wire taps/lockons. Lockons are temporary track connections. See correct way to wire lockons below. Correct - Bare wires can't touch and cause a short. These stranded wires are tinned so they are easier to insert into the clip. Red and black wires are inserted with bare wires toward each other which would be considered "bad practice". The lockons above show a very good example of two different Color Code conventions. 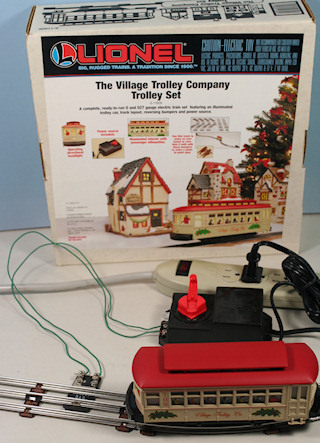 The AC convention that I use is based on 120V residential and commercial wiring postwar toy train wiring. My outside rails/commons are tied in with white wire and variable voltage/center rails are black wire. The AC convention is handy when you get into more than one circuit because there are a lot more colors available. 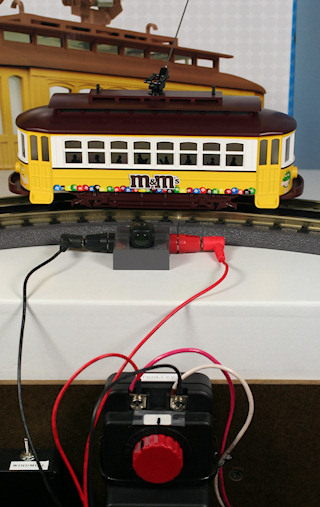 The DC convention that is being use with modern toy train wiring applies to low voltage wiring and electronics. Their outside rails/commons are tied in with black wire and variable voltage/center rails are red wire. Use the Color Code convention that makes sense to you. Follow the instructions that came with your transformer and track. For a temporary layout, any electrical wire with good insulation will work. If there's a large or permanent layout in your future, you will want to glance over the Intermediate section. 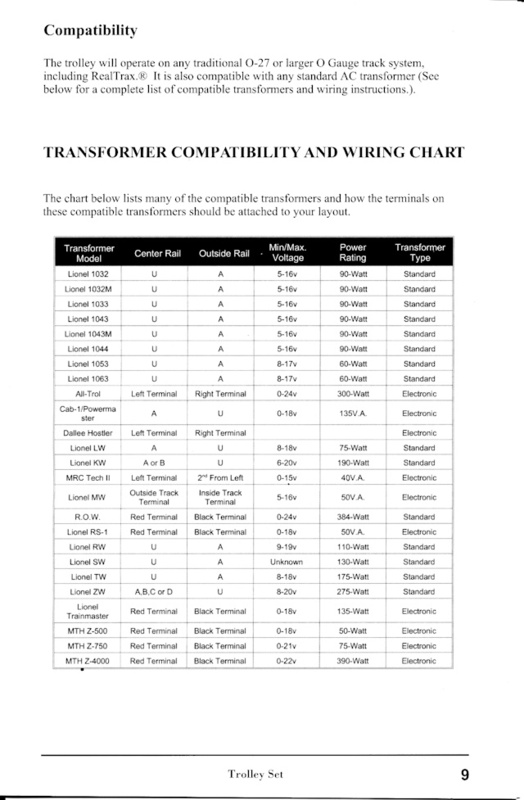 Safety test your transformer. Unplug the transformer. The electrical cord is safe if you bend the cord and the insulation is free of cracks. Turn voltage knobs to Off. Test the transformer breaker by securing a bare wire with one end to the common terminal and the other end to a voltage output terminal. (The wire should be extension cord size or larger.) Plug cord into electrical outlet. Stand by to pull plug while slowly raising voltage with control knob for the terminal where the wire is attached. If breaker doesn't trip within 2 seconds, Pull Plug and replace or have the breaker replaced. The interior breaker protects the transformer, not the trains. 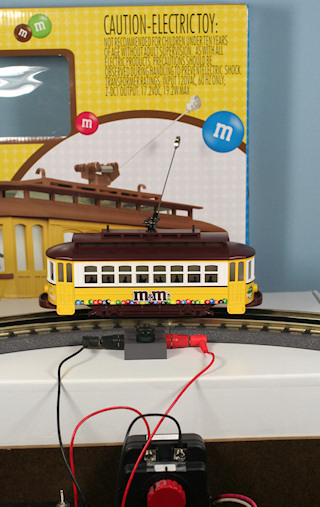 Before you run modern trains you will want circuit protection for the trains. An engine will Not trip the transformer breaker on larger transformers before engine or plastic truck damage can occur.